The results from animal studies suggest that asthma treatment may bizzarely come in the form a diet rich in fruit and vegetables. Tests on mice, as reported in the journal Nature Medicine, has found that a high-fibre diet can impact the balance of microbes in the gut and make airways either more or less susceptible to the inflammation involved in allergic airway conditions such as asthma. Asthma is a long-term respiratory disorder, where the air passages within the lungs unexpectedly become inflamed, narrowed, and swollen. This then prevents airflow into and out of the lungs. Attacks often occur in response to an allergen, cold air, exercise, or emotional stress. It is these triggers which create an inflammatory cascade in the bronchial tree. The last three decades have witnessed a surge in rates of allergy-triggered asthma, in particularly in the more developed nations. Many health experts have attributed this to changes in dietary habits, such as a decrease in our fibre intake. 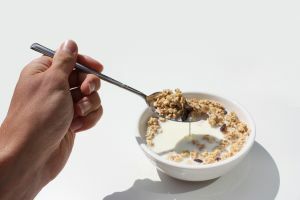 Therefore, Dr Benjamin Marsland of the University Hospital of Lausanne in Switzerland and colleagues, decided to study the variations in the immune and inflammatory responses of mice when the amount of fibre in their diet changed. They discovered that those mice on a low-fibre diet experienced more lung inflammation after coming into contact with dust mites. In comparison, mice given food enriched with pectin – found in cell walls of plants – suffered with less allergic airway problems. It was established that this boost in soluble fibre – most often contained in fruit and vegetables – was converted into short-chain fatty acids. These fatty acids increase resistance to irritation in the immune system. For those who may struggle to adapt their diet to include more fibre, the researchers say that a fatty acid supplement may be instead taken to ease asthma symptoms. It would be foolish though to suggest asthma sufferers should disregard their blue reliever and brown preventer asthma inhalers just yet and merely rely on consuming more fibre. A diet rich in fibre may well be beneficial for asthmatics but it is generally recommended for everybody as it can to help to lower cholesterol, decrease the risk of heart disease and lessen the risk of some types of cancer.